Pre-leasing starts this month at Palmera, the new 50-acre, gated apartment community offering luxury apartment living in Deerfield Township. LEADING NATIONAL BUILDER, HILLS OF BLUE ASH OFFERING 17 UPSCALE FLOOR PLANS. Palmera in Deerfield: looking south at Butler-Warren Road. EXTRAORDINARY APARTMENTS: FEATURING CLUBHOUSE, WALKING TRAILS, NATURE PRESERVE. The expanding Northern Cincinnati/Dayton metropolex, already flush with new investment from partners in the corporate, retail, transportation and health care sectors, today ushers in a major milestone with a new $36 million gated apartment community from Hills Communities: Palmera. The land has been zoned for apartments and owned by Hills since 2000. The launch of this new community (www.PalmeraApts.com) coincides with an increase in demand by the local employment and rental housing markets, creating the need for a luxury product such as the Palmera community being built by Hills. The site is easily accessed by taking the Liberty Way exit off I-75; drive 1.1 miles East to Butler-Warren Road, and take a left; travel 1.4 miles north on Butler-Warren Road, crossing over Bethany Road … project is now on your right, across from Heather Springs subdivision of Four Bridges. The 7,000-SF Clubhouse at http://www.PalmeraApts.com. Palmera represents the latest from the locally-based residential developer, and joins 17 other apartment communities developed or owned by Hills (www.HillsCommunities.com). From its corporate offices in Blue Ash, Hills has developed or established ownership of multi-family communities in Greater Cincinnati as well as Indianapolis, Lexington, Louisville, Dayton, Tampa, Charlotte and Houston. Hills Developers has continually ranked on The Deloitte Cincinnati USA 100 as one of the region’s largest privately-held companies, and is consistently listed as one of the top 100 builders in the U.S. Featuring 360 class A, luxury apartments consisting of both garden-style homes and townhomes, Palmera is designed to provide the latest in convenience, technology, luxury and upscale living to one of the fastest-growing corridors of Greater Cincinnati. The community is strategically located near facilities such as the Liberty Way I-75 interchange, West Chester Hospital, Cincinnati Children’s Hospital Medical Center in West Chester, the Atrium Medical Center in Middletown, Prime Outlets in Monroe, P&G Global Healthcare Headquarters and Kings Island in Mason, and extensive shopping destinations at Tylersville Road and the Voice of America park. Palmera will offer one-, two- and three-bedroom apartments with highly attractive features and amenities such as granite counters, kitchen islands, black Whirlpool appliances, oversized patios and balconies, a mix of wood and tile flooring, and the ultimate in high-end apartment living: garages with direct access to apartments, a rare perk in the Greater Cincinnati rental housing market. The community includes an equally high-end amenity package featuring a 7,000-square-foot, resort-style clubhouse. The clubhouse will be built with a multi-use media center, demonstration kitchen, a health/wellness center, swimming pool, tennis courts and an outdoor fireplace and lounge area. Officials at Hills and its public partner, Deerfield Township, say the Cincinnati/Dayton metroplex has not seen a new apartment community the size of Palmera in a decade. It is the largest rental community developed by Hills in 15 years. 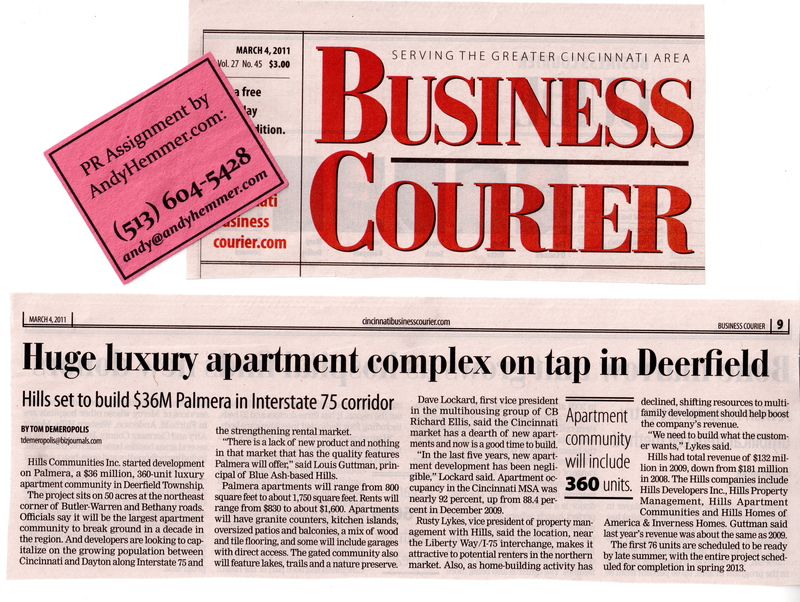 “Our research indicates there is nothing in the northern Cincinnati market that offers apartment living with this amount of space, and accompanied by the high-end design features that people will find at Palmera,” said Rusty Lykes, Senior Vice President at Hills Property Management. “Most people want to live convenient to where they work or play, and this location will meet those needs, plus proximity to great shopping and schools. This will be the community of choice for families, singles, couples and working professionals,” Lykes said. “Palmera is a rental community designed with finishes and features most commonly found in the for-sale market,” said Louis Guttman, a Principal with Hills Communities, founded in 1958 by his father, Murray Guttman. “Besides, Palmera is strategic to Hills, and customers of Hills, because we built the homes nearby in the Heritage Point community,” Guttman added. Green-friendly Palmera has walking, biking trails, nature preserve, lakes. 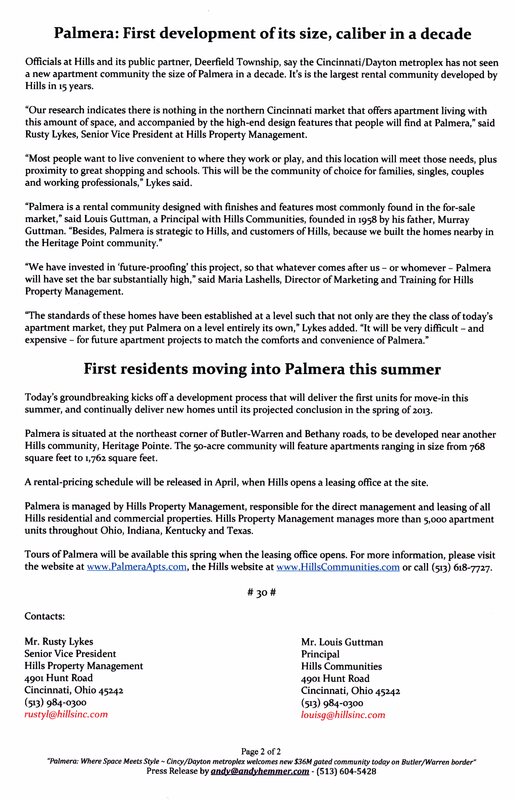 “We have invested in ‘future-proofing’ this project, so that whatever comes after us – or whomever – Palmera will have set the bar substantially high,” said Maria Lashells, Director of Marketing and Training for Hills Property Management. Today’s groundbreaking kicks off a development process that will deliver the first units for move-in this summer, and continually deliver new homes until its projected conclusion in the spring of 2013. Palmera is situated at the northeast corner of Butler-Warren and Bethany roads, to be developed near another Hills community, Heritage Pointe. The 50-acre community will feature apartments ranging in size from 768 square feet to 1,762 square feet. A rental-pricing schedule will be released in April, when Hills opens a leasing office at the site. Palmera is managed by Hills Property Management, responsible for the direct management and leasing of all Hills residential and commercial properties. Hills Property Management manages more than 5,000 apartment units throughout Ohio, Indiana, Kentucky and Texas. Tours of Palmera will be available this spring when the leasing office opens. For more information, please visit the website at www.PalmeraApts.com, the Hills website at www.HillsCommunities.com or call (513) 618-7727. 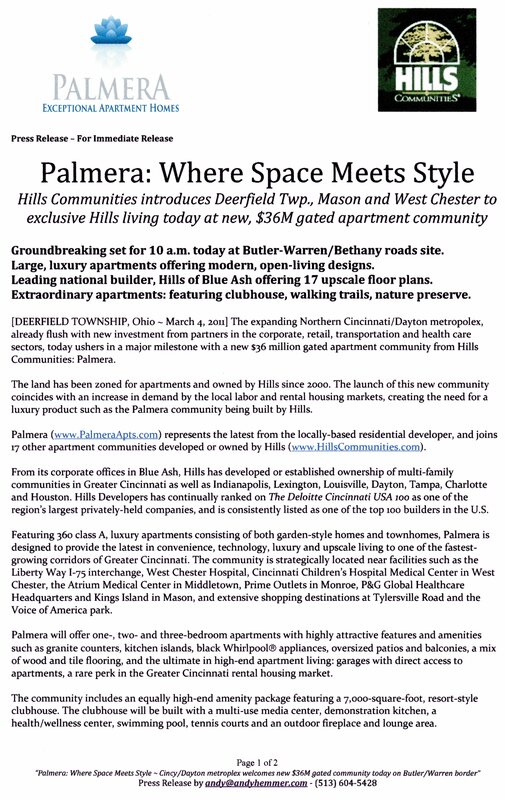 For more information about Palmera and/or Hills, please contact Mr. Lykes at (513) 984-0300 or rustyl@hillsinc.com, or Mr. Guttman at (513) 984-0300 or louisg@hillsinc.com. See you at 10 a.m. today!